Once upon a time, Dr. Seuss wrote a book called There’s a Wocket in my Pocket where a little boy talked to strange creatures living in his house. Nobody really knew what a Wocket was though. NXT-ID, Inc., a biometric authentication company, wants everyone to carry around a Wocket™ in their pocket. The company NXT-ID claims Wocket™ is useless to thieves has plans to launch the Wocket™ in New York City on May 28. Wocket™ is considered the newest smart wallet heading to the e-commerce market. At the launch consumers and media will get the first look and feel of the smart wallet that claims to zeroize each sale immediately making the Wocket™ useless to thieves. The patent-pending Wocket™ uses biometric solutions to secure consumers’ mobile platforms. The smart wallet is designed to replace all the cards in your wallet without the need for a smart phone. It will be 3.7”W x 2.75”L x .39”H. The smart wallet only becomes accessible through a unique combination of voice, PIN or pattern. It was designed to keep Wocket™ transactions separate from regular transactions in order to keep Wocket™ transactions secure by zeroizing each card after use. 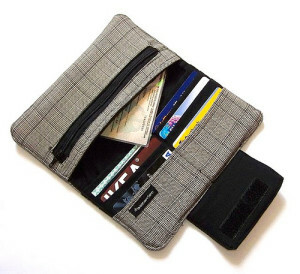 Wocket™ isn’t the first smart wallet on the market. It is an evolution of the smart wallet’s already on the market. Google offered a smart, virtual wallet to help consumers’ keep their information secure. Google Wallet comes in the form of an app or a card that stores credit card and loyalty card information all in one place. Security is the biggest concern for smart wallets since they were designed with consumer security in mind. The Google Wallet offers 24/7 fraud monitoring and Google Wallet Purchase Protection. If your phone or card is lost or stolen it can be disabled through a Google Wallet account. The Wocket™ doesn’t offer a protection program instead it offers a guarantee. There are very few other smart wallets on the market. The Wocket™’s biggest competitor appears to be Google Wallet, but there are a few other smart wallets attempting to emerge on the scene including the PING wallet and the SmartWallit.